For the first 12 hours on June 20 (midnight to noon), approximately 6,790 barrels of oil were collected and approximately 4,280 barrels of oil and 23.2 million cubic feet of natural gas were flared. • and approx. 43.4 million cubic feet of natural gas were flared. One of the more innovative recent technical advances that you have likely never heard of is called Hydro-excavation. It combines the use of a water stream of the sort you find at a car wash (i.e. 2,000 psi water at about 2 gpm) with a vacuum hose attached to a vacuum truck. It turns out to combine into a new tool that is quite effective for disaggregating soil and removing it to leave a relatively dry cavity down to significant depth, quite fast. It has a lot of advantages if you are excavating in an area where there are fiber-optic cables and other underground conduits that might take unkindly to the use of a back-hoe, (Including gas lines). 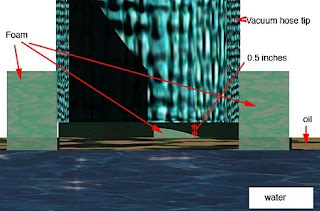 I mention this, because there is a certain amount of the clean-up now going on in the Gulf that can be done with waterjet lances, and some parts of the spill can be cleaned up with suction hoses. (And I have some experience with both, courtesy of helping in the development mentioned in the first paragraph). One of the classes that I have taught involved the use of pressure washers in a demonstration laboratory that supported the class lectures. So I thought I would take a moment to mention some of the things that need to be considered when using pressure wands and suction hoses. The first obvious, but neglected point, is that the operator rarely can judge exactly where the tip is relative to the surface being cleaned. This is actually quite critical because the average pressure wand comes with a fan tip on the end. 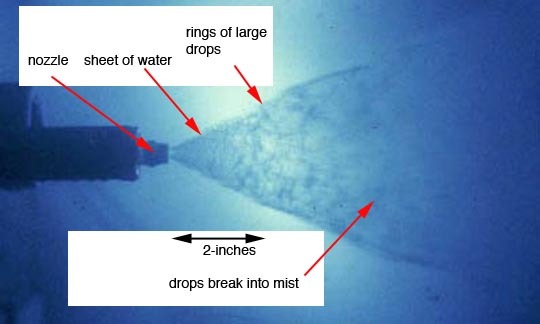 The tips come with different angles of dispersion of the jet, and having photographed a fair number, most jets are about 5 degrees broader than the jet pattern stamped into the nozzle. The second point is the one that is usually missed, but which relates to the distance of the nozzle from the surface. When the jet comes out of a fan jet nozzle, the shape of the nozzle forms the stream into a sheet that gets wider with distance. 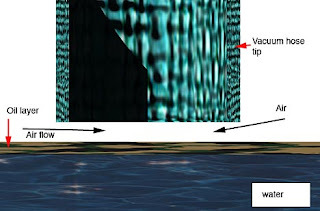 Because the volume of water coming out at one time doesn’t change, the jet therefore gets thinner the further that it gets away from the jet. With a typical nozzle (usually called a tip) the sheet gets thin enough somewhere between 2 and 4 inches that the sheet perforates, and just as with a balloon when it pops, the material pulls back from the hole. 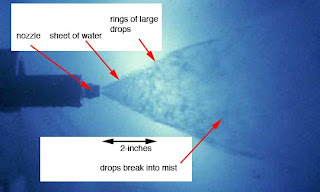 In the case of the water sheet, this creates circles of larger droplets that continue to move forward. It is at this point that the jet is at its most effective, in many applications. However, those droplets that are moving originally at about 550 ft/sec are moving into air that is relatively stationary. It breaks these large droplets up and decelerates them over the next couple of inches. As a result, the jet becomes virtually powerless within about 6-inches of the nozzle. (The distance varies with nozzle manufacturer, design flow rate and operating pressure – but that distance is typical). If you hold the nozzle further away from the target than that you are merely getting the surface wet, and not moving anything but surface dirt. The problem that you, as an operator, have is that it is very difficult to judge that 6-inches. (Making it easy to “catch the student in error” at the beginning of the lab and reinforce the lesson). So the simple way to resolve the problem, is to touch the target surface before you start, position your feet accordingly, and then back the lance off a little and you are likely to be much more effective. Having cleaned a wall of my house with an 18-ft extension lance to the normal pressure washer last week, I can also add that trying to maintain a 2-4 inch standoff while holding the lance above your head is an art that has to be learned. OK, now the next problem is that most of the material being removed is going to be some form of hydrocarbon (oil. Oil emulsion or something similar). Some of these are quite sticky and hard to remove with just water pressure. In this case if the water is heated to about 185 deg F it will cut through and remove those coatings a lot more easily than at a lower temperature. You don’t want to heat it all the way to steam, since that loses the pressure of the jet at the nozzle too quickly, but with hot water the range can be extended. One other way to extend the range is to use a spinning round jet nozzle (sometimes called a 0 deg tip). There are a number of these on the market and the cone of the jet is created by rapidly spinning the cylindrical jet that comes out of the nozzle. Depending on the quality of the nozzle (and diameter and pressure) these can increase the jet range to a foot or more. If you work out the amount of energy and water required to clean a surface both ourselves and some folks in Germany have shown that using this rather than a fan-jet can drop the amount of energy and water that you use to clean that surface by up to 90%. The final point I want to make deals with the use of suction hoses. These are now appearing more frequently in some of the locally made systems being fielded along the Gulf. While the same basic argument about the operator not knowing where the tip is, still applies, there is a different reason as to why this is important. In most cases the object is to pull a relatively thin film of oil from the surface of the water. The ideal place to hold the end of the hose is just above the oil: water level (less than half-an-inch). The air drawn into the gap helps pull the surface layer into the hose, and you don’t pull in a lot of water. Unless you have really good control of your position (bearing in mind you are looking along the hose at the water) this is very hard to sense. If you push the hose into the water hardly at all then you pull in too much water and not that much oil. If you tilt the hose then it tends to pull in a lot of air, and not a whole lot of water or oil. The best way to control the position is to have the end of the hose attached to a piece of foam that will float and in this way the mouth of the nozzle can be placed where you want it. It is easier to do this if you bend the hose so that most of it is lying on the foam, and not pushing it into the water, but in this way, depending on the amount of oil, you can slide the nozzle up and down in the foam to get the best distance to recover the oil. That half-inch distance is fairly critical for best performance, especially if you can keep just below it. (Yeah we actually did experiments where we adjusted it). There are now whole books on this technology, and some safety recommendations on how to use some of the equipment, as the industry continues to grow. Hopefully this has been of some help. What one learns in one application can be quite usefully applied, often in others.